The New MultiSure GK Blood Glucose and Ketones Monitoring System offers a quick and easy way to test for both glucose and ketones in blood, using separate test strips to determine the risk for DKA-Diabetic KetoAcidosis.DKA is a serious complication of diabetes that occurs when your body produces high levels of blood acids called ketones. Ketones must be tested only when the blood Glucose is over 250 mg/dl. Blood glucose testing requires 0.5μL of blood and the result can be obtained in 5 seconds. Ketones testing requires 1.3μL of blood and the result can be obtained in only 10 seconds. The Ketones monitoring system is essential for Diabetes and especially for Type 1 Diabetes. Ketones Test results. Under 0.6 mmol/L, Indicates a normal blood ketone value. 0.6 to 1.5 mmol/L - Indicates that more ketones are produced than normal, Test again in 3-4 hours to see if the value has lowered Values 1.6 to 3.0 mmol/L means High level of ketones and could present a risk of ketoacidosis. It is advisable to contact your doctor for advice. Above 3.0 mmol/L - Indicates a dangerous level of ketones which will require immediate medical care. Measurement Range of the meter : Glucose: 20 - 600 mg/dL (1.1 ~ 33.3 mmol/L) Ketones: 0.1 - 8.0 mmol/L. Testing Time : Glucose: 5 seconds, Ketones: 8 seconds. Hematocrit Range (%) : Glucose:10% - 70% Ketone: 30% - 60% Operating Temperature (°C) : 5°C ~ 45°C. Sample Volume (μL) : Glucose: ≤ 0.5 μL,Ketones: ≤ 0.8 μL Memory : Glucose:500 tests, Ketones:100 tests results. KIT CONTENTS: Test meter,5 pcs. Ketone test strips, 10pcs. Glucose test strips, Lancing Device, 10 pcs. Lancets 2 CR2032 Batteries( Incl. in the meter) Soft carry Bag. User manual instructions in English. 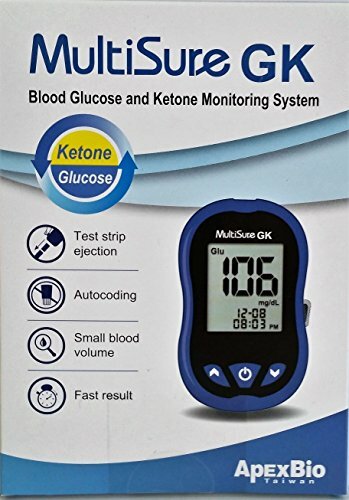 NEW MULTISURE GK Blood Glucose & Ketones Monitoring system. KETONES AND BLOOD SUGAR MONITOR.